I have to honest, this cake gets me going, it is so darn delicious! My boyfriend and I are very opposite, from our appearance to our personalities, we are pretty ying and yang, but as you know opposites attract! 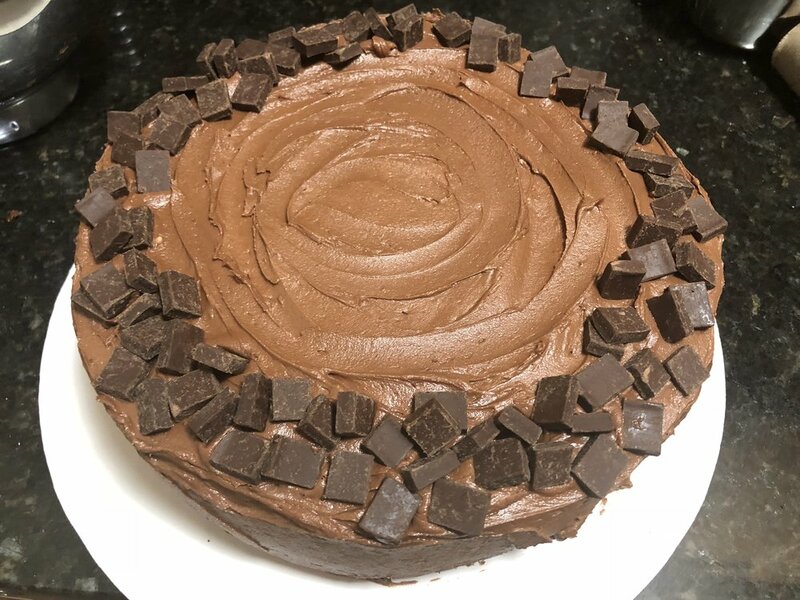 Something we do have in common, besides our names (Danielle and Daniel), is we LOVE Peanut butter and chocolate together, so back in September I came up with this recipe for Dan's birthday. We are two weeks away from Christmas now and this is the perfect cake to give as gifts to coworkers, neighbors, mailmen..whomever! It is made in a large rectangular pan, so you can cut it into big squares and pack them into nice little boxes tied with holiday ribbon. If you are not a peanut butter person you can leave it out and it just becomes a double chocolate crumb cake! Enjoy! Pre-heat your oven to 350 degrees. Prepare a 13inch x 9inch pan or a "jelly-roll" pan ( a pan about 15-inch by 10-inch by 2-inch) if you'd like, by greasing the pan generously with butter and dusting it with flour. You can also line the bottom with parchment paper after you butter it if you are worried about it sticking. In a separate bowl combine the flour, cocoa powder, salt, baking powder and espresso powder. Set aside. In a stand mixer or using an electric hand beater, cream the butter and sugars together. Once the butter mixture is nice and light add the eggs one at a time until they are fully incorporated. Next add the vanilla. Next add the dry ingredients into the butter/egg mixture alternating with the sour cream. Pour batter into the prepared pan. Place the peanut butter into a microwave safe bowl, and microwave it for about 30 seconds or until it is liquidy. Drizzle the peanut butter all over the cake and then use a butter knife to swirl it lightly around the cake. You want to see the peanut butter so do not mix it completely into the batter. Place the cake into the oven and bake at 350 degrees (F) for 15 minutes. While cake is baking, make chocolate crumb topping as follows: In a large mixing bowl, stir together 2 cups all-purpose flour, 1 ¼ cups sugar, and 3/8 cup cocoa powder. Add 2 sticks melted butter and stir until mixture is thick and workable. With your hands, pinch off chunks of the chocolate mixture and place them on top of the partially-baked chocolate cake. Continue until all of the chocolate mixture is used and the cake is evenly covered. Return the cake to a 350 degree (F) oven, and bake an additional 10-15 minutes, or until a toothpick inserted in the center comes out clean. Remove cake from oven. Do not over bake, you want it to be a little fudgy inside, but make sure it is set! Remove the cake from the oven and let cool completely. Dust the top with the confectioners sugar and enjoy! For an added touch, melt 1 cup of peanut butter chips (reeses makes them in the baking isle), in the microwave with 1 teaspoon of crisco shortening and then drizzle it over the top of the cake. Once it hardens and cools enjoy! Place the chicken with the breast up on a roasting pan. Make sure it is dry and if not pat it down with paper towels. Stir the entire ranch seasoning packet into a bowl with the softened butter and mix until well combined. Stuff the cavity of the chicken with a few pieces of carrot, celery and shallot and then place the remaining mirepoix around the chicken on the roasting pan. Loosen the skin of the chicken with your hands gently, being careful not to tear it. Then take the seasoned butter and rub it under the skin of the chicken generously. Make sure you get the thigh area and as close to the legs as you can. Take some of the butter and rub it on the outside of the skin as well, this will give it color and help it to crisp up. Sprinkle the skin with a little salt and ground pepper, not too much salt though as the ranch seasoning has a lot of salt. Place the chicken in the oven and cook for about 1 1/2 hours or until the juices run clear and the chicken reaches 165F in the thickest part of the meat. Make sure to take the temperature of the thigh as well since the dark meat usually takes longer to cook. Take the chicken and place it on a cutting board and let it rest for about 10-15 minutes. Pour the drippings from the roasting pan in a pot and as the grease settles to the top, skim the oil off and discard, leaving you with just the juice of the chicken. Place the drippings back on the stove in a small pot, add a tablespoon of Wondra flour at a time and whisk quickly. Cook down and add more flour until you reach your desired thickness for the gravy. Cut up the chicken and serve with the roasted veggies from the pan and the gravy. One of my favorite parts of the holiday season is enjoying my family recipes that have been passed down for generations. For as long as I can remember I have been enjoying my grandma's Neapolitan style stuffing every Thanksgiving. The most unique part of this stuffing is that the main ingredient is not bread, it is actually egg. This stuffing will really give you a true taste of old world Naples, Italy, because it contains a few classic Neapolitan ingredients including Pine Nuts, Raisins and Prosciutto. This stuffing is sweet and savory and has a wonderful moist, eggy texture. You can make the stuffing and then put it inside the turkey before you cook the big bird, or you can make it separate like my family does. Two 10 oz Boxes of White Mushrooms- You will be using the stems only! Remove the Stems and boil them for 5-10 minutes or until tender. Drain and dry with paper towels. Then dice into small pieces. Heat a few tablespoons of olive oil in a large frying pan (just enough to coat the pan). Pour the stuffing mixture all at once into the pan and use a wooden spoon to push the ingredients around as they cook just like you would scrambled eggs. Once the eggs fully scramble and the ingredients come together and the cheese is melted etc. you are all done! If you make it ahead, just pour the stuffing into a pyrex dish and then reheat in a low oven. You can also stuff your turkey with this stuffing and tie the legs of the turkey closed so it doesn't fall out. It is Stone Fruit month at the Farmer's Market! My favorite fruit in the entire world is peaches..I mean come on, fleshy, sweet, juicy, colorful..DEEELISH! Now that we are at the peak of the season for peaches, plums and apricots, it was time to make a pie. Now this is not any pie, this is a galette which is essentially a buttery, flaky pie dough that you fold around fresh fruits...no pie pan or tart mold needed! Once you get the hand of this simple dough recipe, you can stuff anything your heart desires inside, based on what is in season. At the start of the summer you can do strawberries and rhubarb, in the middle of the summer you can do blueberries and in the Fall you can do Apples. When you take a few extra minutes to nicely arrange the fruit in an elegant pattern inside the dough, you are left with a work of art! Top this warm galette with your favorite flavor of gelato like vanilla, strawberry, or even something unique like green tea and enjoy! For more culinary inspiration follow me on @Gotroomformore ! Cut cold butter into small (1/2-inch) cubes and add it to the food processor. If doing it by hand use a pastry cutter or two butter knives and cut the butter into the flour until it is the size of peas. If using the food processor, push the pulse button 8 times until the butter is pea size. Add the 1/2 teaspoon of almond extract and 1/2 teaspoon of vanilla extract to the ice water and add 1 Tbsp at a time to the flour mixture and pulse between each addition. If doing by hand just stir together with a fork until you see the dough is starting to come together. Your dough should be ready when it just begins to clump. It should take about 4-6 tablespoons of water. Form the dough into a disk. Don’t overwork it with your hands because the texture of the dough will get tough. Just pat it into a disk shape, dust with flour on all sides and cover with plastic wrap. Refrigerate for 45 minutes. In a small bowl, beat the egg and set aside. Slice peaches into ½″ thick slices. Place peaches in a bowl and sprinkle with flour, sugar, cinnamon and vanilla. Stir gently being careful not to break up the peaches. In between 2 sheets of parchment paper, roll the dough into a 12″ circle. Place the parchment paper and dough into a rimmed baking sheet. Remove the top piece of parchment. Arrange the peaches in circles over the dough working from the outside in. Leave a 1.5″ to 2″ dough border. Discard any excess juices from the peaches, or your galette may overflow. Dot the top of the peaches with small chunks of 1 Tablespoon of butter and sprinkle the top of the peaches with the 1 Tablespoon Dark Brown Sugar. Fold the edges of the gallette up and over the peaches, pinching the overlapping edges together to form a nice seal. If there are any tiny holes patch them up with dough. Brush the crust with beaten egg and sprinkle with cinnamon and sugar in the raw. Bake for 18-22 minutes until the crust is golden brown on the sides and the bottom. Let sit 15 minutes before serving. 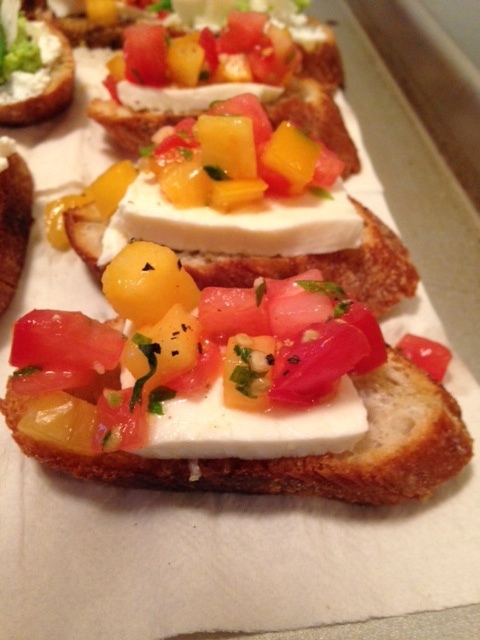 Serve with you favorite vanilla ice cream..or even green tea ice cream is fabulous with this too! Happy Cinco de Mayo!!! Growing up in a very Italian family, I was never introduced to Mexican food. It wasn't until I was in late High School that I experienced it for the first time when my friends took me to a local Mexican joint. Lets just say I fell in love right away! Now Mexican food is a staple in my diet, and it is one of the most fun types of cuisine to make especially when you are entertaining. Last month I spent 2 weeks in sunny California, where Mexican food restaurants are on every corner, and each have something fresh and delicious to offer. My favorite Mexican dishes have a nice balance of meaty, creamy, spicy, sweet, crunchy and zesty. I have made many fish tacos over the past few years and I can honestly say that this is my BEST one yet. 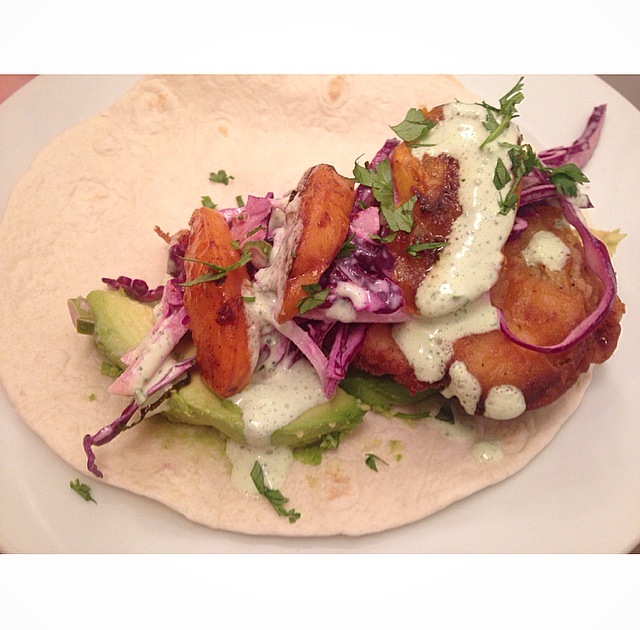 This one has a layer of creamy, rich avocado, crunchy and sharp red cabbage and jicama slaw, crunchy, smoky Chipotle Beer Battered Fish, sweet and juicy Grilled Chili Lime Apricots and finally a silky, tangy Lime Crema. If you make these tonight for your Cinco de Mayo fiesta along side a cold margarita, you will have your family and friends salsa dancing through the house. .
1.5 Lbs of Fresh White Fish (I use Flounder but Cod is great too) - Make sure there is no skin or bones! Cut the filets in half long ways if they are very large. 1/2 Teaspoon Salt plus more to sprinkle on the hot fish when it comes out of the oil. If you like more heat add some hot sauce, Sliced Jalepenos or spicy salsa! Open the can of chipotle peppers in adobo sauce and pour it into a container. Place the fish filets in the container and rub the sauce all over the fish. Set in the fridge for about 45 mins to an hour while you are making all the other elements of the dish. In a small bowl whisk together the Vinegar, Mayo, Dijon, Celery Seed, Lemon Juice, Salt and Pepper. In a larger bowl toss together the Shredded Red Cabbage, Shredded Jicama and Chopped Scallion. Pour the dressing over the slaw and toss until evenly coated. Set aside in an air tight container int the fridge. You can do this a day ahead or a few hours ahead if you'd like so the flavors meld together. In a food processor blend all the ingredients until smooth. Adjust the seasoning if need be. Set in the fridge covered until its time to eat. Gently toss the sliced Apricots with the brown sugar, lime zest, a few dashes of Mexican Chili Powder and one dash of Paprika and a pinch of salt. Make sure they are evenly coated. Heat an indoor grill pan or skillet on medium high heat. When it is nice and hot wipe the pan with a little bit of canola or olive oil so the fruit doesn't stick. Grill the Apricots on both sides until they are nice and caramelized on both sides. Remove from the pan and set aside on a plate. In a shallow, side dish whisk together the 1/2 cup rice flour, AP flour, baking powder, salt and pepper and egg. Slowly whisk in the beer. Heat a deep skillet on medium heat and add the canola oil until nice and hot. To test if the oil is ready, place a drop of batter into the oil and if it starts to brown and float to the top and bubble up around it then the oil is ready. Take the fish out of the adobo sauce and dredge it in rice flour on all sides until it is covered. Then gently dip the fish in the batter allowing the entire filet to get coated, then let the excess drip off. Quickly lay the fish in the hot oil. Cook the fish on one side until it is nice and crispy and golden brown then using tongs gently flip the fish onto the other side. Cook until golden and then transfer onto a pan lined with paper towels to get ride of excess grease. Sprinkle with more salt when it is hot. Be careful not to crown the fish in the hot oil because the temperature will go down and you will have soggy fish. Do it in batches or have two pans going at once so you can cook it all at once. In a warm tortilla place a few slices of ripe avocado. Place a nice scoop of the cabbage jicama slaw on top of the avocado. Place a piece of the crispy fish on top. drizzle it all with the Lime Crema and then top it with a little chopped cilantro and any other toppings you'd like, including Mexican shredded cheese, diced jalepenos or salsa. In my opinion salsa is not needed because the apricots give the taco a nice juiciness and fruitiness that a mango salsa would do! Mix together butter, oil, sugars and eggs. Add mashed bananas, sour cream and vanilla, stirring together well. Mix together the flour, baking soda and salt in a separate bowl and then add it slowly to the banana mixture. Bake at 325 degrees: large loaf pan for about 1 hour, for muffins around 25 minutes or until golden brown and a toothpick comes out of the center clean. Allow bread to cool in pans for about 20 minutes, then run a sharp knife around the edges, tap the pan on the counter several times to release the bread from the bottom of the pan, then invert pan over a wire rack and let the bread fall onto the rack to finish cooling completely. -Use good bread! The best breads to use are thick, eggy breads like Challah bread (my favorite), French Pullman bread, Brioche, or breads that have yummy flavors like cinnamon swirl bread, or those new sliced white breads that have flavors like Pumpkin Spice and French Vanilla. -Make sure your egg/custard mixture is flavorful! Make sure you add some sugar, some vanilla extract, or vanilla bean (or almond or orange extract can be nice too!) and a pinch of salt. This will ensure that you have a flavorful french toast inside and out! -Soak it for several hours or overnight! My french toast casserole especially and all other thick pieces of bread that are used for French Toast should be soaked in your egg and milk/cream mixture overnight to ensure that the inside gets all the yummy flavors and texture as well. When you cook it the outside will be nice and crisp and brown and the inside will almost be custard like..rich and heavenly! -Add Pumpkin Pie Spice, Cinnamon and Nutmeg to the egg mixture to make a nice fall casserole. You can even whisk some pumpkin puree into the egg batter. Butter a 13inch x 9inch Pyrex dish or any Casserole oven-safe dish you have. Arrange bread nicely in the baking dish. If you want to put fruit or any filling do it now! Layer your bananas, jam, chocolate chips or whatever you'd like in between the layers of the bread. In a large bowl whisk together the eggs, half and half, sugar, vanilla, cinnamon, nutmeg and salt. Pour mixture over the bread in the baking dish. Cover with plastic wrap and refrigerate overnight or for at least 7-8 hours. Remove from the fridge 25-30 minutes before baking. Preheat the oven to 350F. Dot the top of the French Toast with small pieces of the butter. Sprinkle the top with a little Cinnamon if you'd like and then sprinkle some granulated sugar evenly over the top. Not too much but just enough to get a nice crystal like appearance when you bake it. Bake for 40-45 minutes or until the French Toast puffs up and the center comes out clean. Let it stand for 5 minutes to cool slightly. Serve with maple syrup! This should feed about 10 people but if you have extra just put it in the fridge and eat it all week! Just heat it in the microwave. One year ago I was on the beautiful island of Sicily with my big, loud, Italian family. There are many dishes that are specific to the Sicilian culture that I grew up eating, and I couldn’t wait to get my hands on the “real thing.” Canolis, Eggplant Caponata, Cassata Cake, Fig Cookies and of course Arancini. Arancini are a popular street food in Sicily, so common that you can even purchase them at a gas station convenience store. Arancini are these dense, creamy, cheesy, fried rice balls that are often stuffed with things like ham, peas, ground beef and tomato sauce. The Sicilians make these so well, that even when you purchase them from a sketchy “mini-mart” chances are they are still going to be down right delicioso. I decided to reinvent Arancini and combine them with another classic rice dish, Rice Pudding. My Sweet Arancini are crunchy, creamy bundles of gooey, rice pudding, coated in a blanket of delicious graham cracker crumbs and fried to perfection. 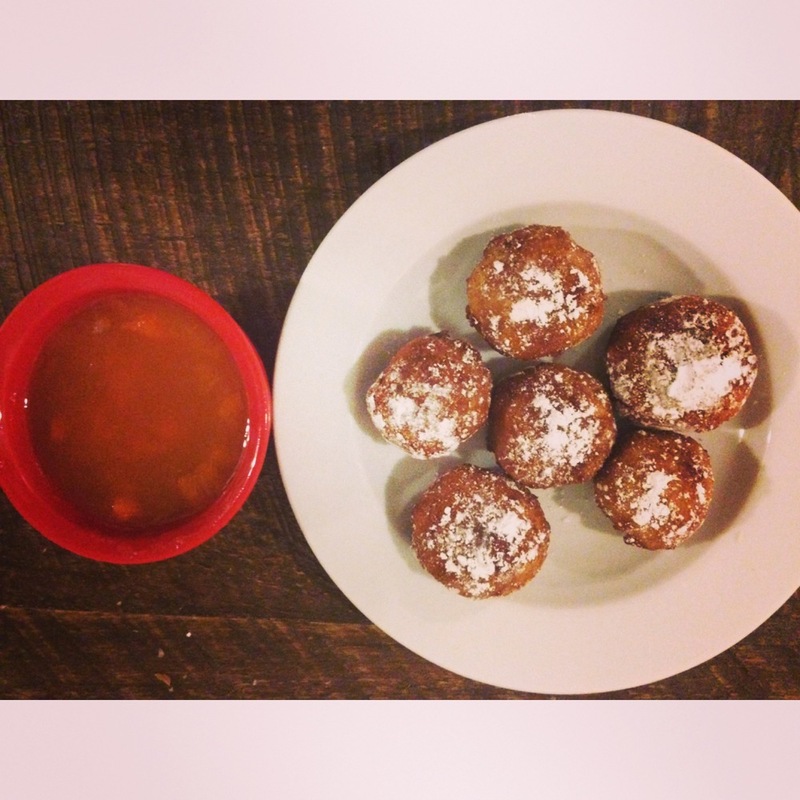 These bella balls are not complete without their silky, tangy Apricot and Peach dipping sauce. Make these for your next soiree and I promise you everyone will not be able to take their hands off your rice balls. First make the dipping sauce. Remove the pits from the apricots and chop the flesh into small chunks. Melt the butter in a small saucepan and add the chopped fruit. Cook down on low heat until some of the juices release from the fruits. Add the peach preserves and melt down until it thins out and becomes a sauce consistency. You may need to add some water if it is too thick. Place in the fridge until you are ready to use. If the sauce gets too thick just add a little water and heat it up in a pot or the microwave for a few seconds until it is warm and thins out. In a medium pot, bring the water and rice to a boil. Stir, cover, and simmer for about 15 minutes or until the water has been absorbed. Add the milk and bring to a boil. Simmer gently, uncovered, for about 30 minutes, stirring frequently until the rice is tender. Set aside. In a bowl, combine the sugar, cinnamon, nutmeg and cornstarch. Add the egg and vanilla and combine with a whisk. Gradually pour this mixture into the rice pudding and cook for about 2 minutes over medium heat, stirring constantly, or until the rice thickens and becomes very sticky like risotto. Spread the rice in a baking pan or loaf pan and cover with plastic wrap. Refrigerate for about 2 hours or until completely chilled. This is a great thing to make the day before! You want the texture to be very thick and gelatinous so you can form balls easily. Next, preheat the canola oil in the deep fryer on high temperature. Set a wire rack and paper towels aside. Place the flour, eggs, and graham cracker crumbs in three separate bowls. Set aside. With your hands, shape each ball of the rice pudding. You want them to be a little bigger than ping-pong balls, but you can make them as big or as small as you like! A small 1 1/2 inch ice cream/cookie scoop works well too! When doing them by hand flour your hands to prevent the rice from sticking to you. You can also stuff them with any sweet treat you would like if you wanted! Dredge the balls in flour and shake to remove any excess. Dip them in eggs and drain. Coat with the graham cracker crumbs. Fry the pudding balls, a few at a time until they are nicely browned and have a nice crunchy outside, about 2 to 3 minutes. Drain on the baking sheet and paper towels and continue with the remaining balls. Dust the rice balls with powdered sugar and serve slightly warm with the apricot peach dipping sauce! I was born and raised a New Yorker so naturally I love me some cheesecake! Cheesecake is rich, creamy, dense, tangy, mildly sweet and just so comforting to consume. As much as I love NY style Cheesecake, it can be a super heavy dessert to eat after a big meal. After growing up in a Sicilian household and traveling all over Sicily last summer, I discovered the beauty of using ricotta cheese in desserts. Sicilians use ricotta based fillings and custards in tons of desserts like layer cakes, cream puffs, casadelle (fried “calzone” shaped pieces of dough stuffed with a delicious sweet ricotta filling and chocolate) and many more! This Easter I came up with my own Sicilian style cheesecake recipe that was such a hit, even my Dad’s cousin Sal who was visiting from the motherland gave it a “molto bene!” This cheesecake is light and buttery and has a wonderful citrus flavor that is perfect for any spring/summer get together. 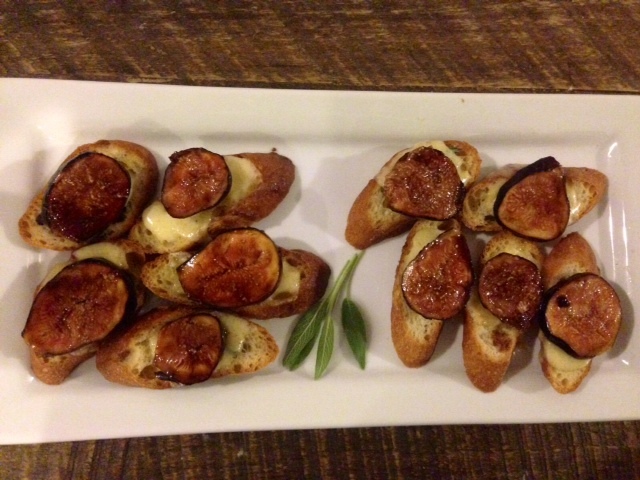 This recipe is pretty simple to execute and is always a hit with my guests! Remember tweet me or Instagram me pics of your Got Room For More creations @gotroomformore. If there is a lot of excess water in your ricotta (which may happen if you use fresh/homemade), drain the ricotta in a colander or in some cheesecloth set over a bowl for about 30 minutes to an hour. In a small bowl stir together the biscotti crumbs and melted butter. Cover the bottom of a 9-inch springform pan with aluminum foil. Make sure it is covered well so the water bath doesn’t get into the pan and make the crust soggy. Make sure the foil is not bulky so the pan can lay flat. Pour the buttery cookie crumbs into the springform pan and press them into the bottom of the pan and up the sides of the pan a little. Make sure there is a thin, flat, even layer throughout. Place the pan in the oven for 8-10 minutes or until slightly dry and starting to brown. Using an electric mixer, beat the ricotta, mascarpone and sugar together until smooth. With the mixer Add the eggs one at a time, orange zest, cream, vanilla and orange juice and mix until completely smooth and combined. Pour batter into the prepared springform pan and set the pan inside a larger pan (roasting pan, jelly roll pan, glass Pyrex dish etc.) Fill the outer pan with boiling water until it reaches about halfway up the sides of the cheesecake pan. Bake for 1½ to 2 hours or until the cheesecake is mostly set in the center. Turn off the oven and let the cake rest inside for 30 minutes. Remove cake from the oven and let cool to room temperature on a wire rack. Run a sharp knife around the perimeter of the cake to loosen it and unmold. Chill the cheesecake in the fridge for several hours or overnight. Make the whipped cream topping (see below) and spread it over the top of the chilled cheesecake. Top with fresh raspberries or just some powdered sugar and some orange or lemon slices as I did. Beat together in a stand mixer or with a hand mixer or whisk until the cream has stiff peaks and turns into whipped cream.